Do you struggle with failing willpower to get certain tasks done? Whether it’s making those calls you don’t want to make, the bookkeeping (my personal bugbear), emails, whatever. Creatives notoriously struggle with tasks essential to keeping a business/career on track for a variety of reasons. Often times the tasks are just plain boring, but sometimes there is a lot more psychology behind it. Fears of failure or rejection, anxiety about doing something outside your comfort zone, and, yes, even a fear of success! There is a large school of thought these days that supports the ‘lizard brain’ theory. Actually the lizard or reptilian brain is just one part of the brain known as the limbic system. I’ll try not to get too geeky, so hang in there! Evolutionarily speaking, the limbic system is the ‘oldest’ part of our brains and enables a variety of functions including emotion, behaviour, motivation, long-term memory and the sense of smell. The ultimate purpose of this part of the brain is your survival and well being. Think of it like your personal bodyguard. The trouble is, that bodyguard is taking its job way too seriously! Your bodyguard brain is always trying to act in your interest. To move you away from danger and into a place of safety and comfort. When you try to do something new, or change an old pattern of behaviour, your bodyguard brain sets off the alarm. It loves the safety of familiarity not the risk of change. Doing something new or changing an established habit presents unknown circumstances, which could be dangerous. Your protective bodyguard brain says ‘NO!’ And how does it say no? It makes you feel bad, uncomfortable, fearful, nervous. By the same token, doing something that you associate with negative emotions such as displeasure, discomfort or disinterest is acting against the prime directive of your bodyguard brain, and good luck with that! The act of challenging your bodyguard brain by doing something new, changing an existing habit, or doing something that doesn’t feel good is exactly where willpower comes in. By definition, you have to overcome your bodyguard brain and ‘fight’ against yourself and that’s hard work. Although the limbic system can’t process language, it does communicate with your thinking or cognitive brain where language is at home. Words can conjure powerful emotions, both good and bad. We think in words and what we think can affect how we feel. When you say to yourself ‘I don’t feel like doing that’ or ‘I hate doing that’ you are stirring up negative emotions that your bodyguard brain interprets as a no go. That’s the resistance you feel. Your bodyguard brain is also in charge of your motivation so the outcome is clear! Getting that job done is going to need a huge amount of willpower to conquer the resistance and win this internal struggle. Luckily, your thinking, talking brain is under your control! Changing the way you talk to yourself can change the way you feel. The golden rule is to prepare your emotional state first. Start off by making some general statements that make you feel optimistic and positive, even if they are unrelated. Focusing on things that make you feel better will soothe your bodyguard brain. Now it’s time to get more specific. Encourage rather than punish yourself if you feel resistance. ‘I don’t like making calls to customers but that’s OK, it’s understandable’. Talk to yourself as you would to your best friend who is struggling with a challenge. ‘You’ve made loads of calls in the past and managed those just fine’. Focus on the outcome and how good that will be. ‘Once I make that call, I’ll feel really satisfied’. Think about why the task has to be done and how accomplishing it will move you along your path. ‘If I make that call and feel good about doing it, I’m more likely to win that new customer’. It might sound trivial, but it really works! 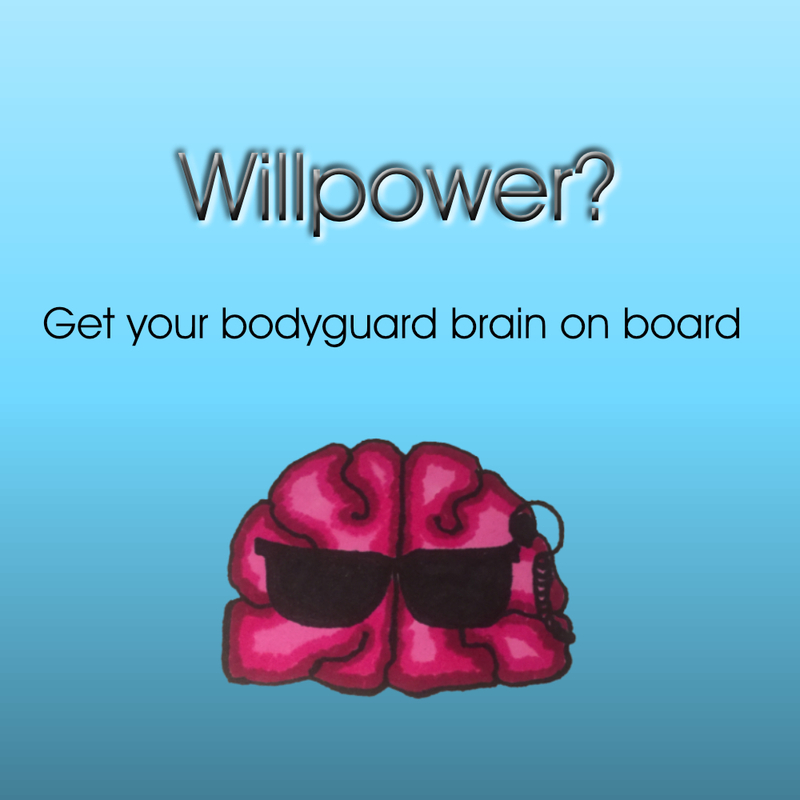 We have all heard that willpower is something you can train like a muscle. Do it the easy way – soothe your bodyguard brain repeatedly. Once it’s figured out you feel good about doing this task and it becomes familiar, it won’t even turn up to object. And the best of all, if you feel good doing it, your motivation will soar and you won’t only complete your task, you’ll ACE it.